Our full suite of proprietary, patented demand-driven software solutions orchestrates your manufacturing operations and extended supply chain in real-time, to minimize variability and maximize control. Our user-friendly technology helps you make the right decisions at the right time, to improve velocity and predictability — particularly of your bottom line. Synchronize long-term capacity and production planning with profitability goals. Manage capacity and production costs against individual products to maximize your profitability. Our S&OP software provides user-friendly planning and reporting functionality — and an unprecedented level of control. Synchronize demand, data and operations across multiple facilities. If you have multiple manufacturing facilities scattered far and wide, Synchrono® has an enterprise solution for you. Our SyncEnterprise™ software coordinates and brokers demand across multiple locations — and synchronizes your supply levels to that demand. You’ll be connected like never before, with centralized visibility and control of your entire manufacturing operation. Synchronize and clarify performance metrics. 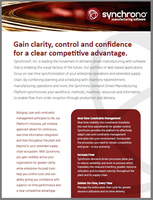 A powerful complement to SyncManufacturing™ software, SyncAnalytics™ software provides a digital dashboard that displays key performance indicators at a glance — and exports report screens to other software applications. Reliable, real-time data simplifies analysis in ways that conventional business intelligence tools don’t. Synchronizing key data elements and customizing SyncAnalytics™ software to feature the analysis, charts, meters and alerts you use most will make you a more confident decision-maker. For a demo of our proprietary, patented software or to learn more about Synchrono®, contact us today.